The trail begins at historic Windsor / Richmond area which lies 47km almost due west of Sydney. Windsor is outlined in the Hawkesbury Upper Pub Trail and with nearby Pitt Town, serves as an excellent stop over location away from the inner congested areas of suburban Sydney. Heading west along the Windsor-Richmond Rd out of Richmond, highway 40 which becomes Kurrajong Rd as you go through North Richmond. This becomes the start of what is known as the "Bells Line Of Road" - an unusal name for a road, but it takes you up the hills to the township of Bell. 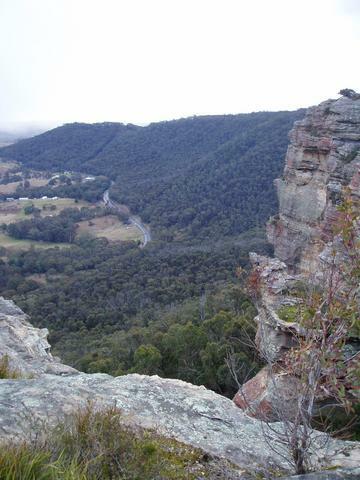 The hill climb is quite steep, as you pass through Kurmond, Kurrajong, Kurrajong Hills and Kurrajong Heights. 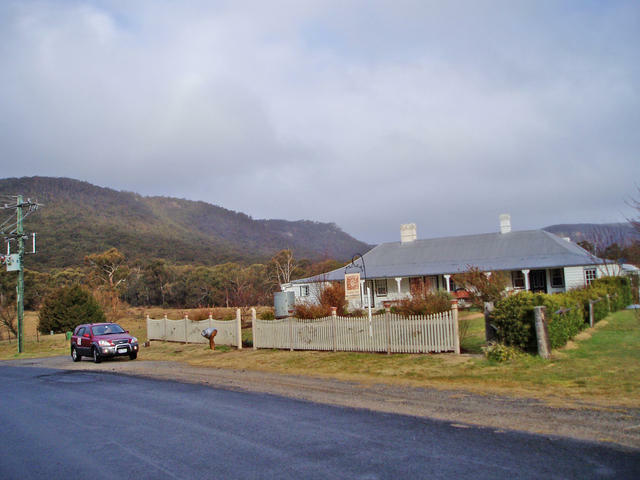 Once on the plateau, you travel on through the picturesque area of Bilpin, Barembing and then up to Mt Tomah which is renowned for its botanical gardens. A winding route takes you eventually to the town of Bell where we suggest you take a shortcut LEFT over to Mt Victoria. Mt Victoria is right on the western extremity of the magnificent Blue Mountains tourist area, which is best travelled by car only, as you explore the many falls, scenic rides like the Skyway and Railway, and take walks deep into the valleys below. Echo Point, The 3 Sisters, Leura Cascades and Katoomba Falls are just a few of the many local treats here. 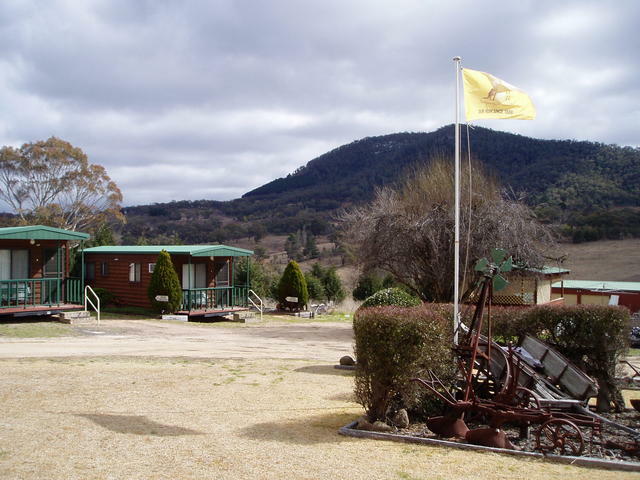 But, if caravanning or wanting to stay a little away from the crowd, we suggest you slip down the mountain to Hartley or Lithgow just west and below Mt Victoria, and settle in for a few days to come back and fully explore the surrounding areas. 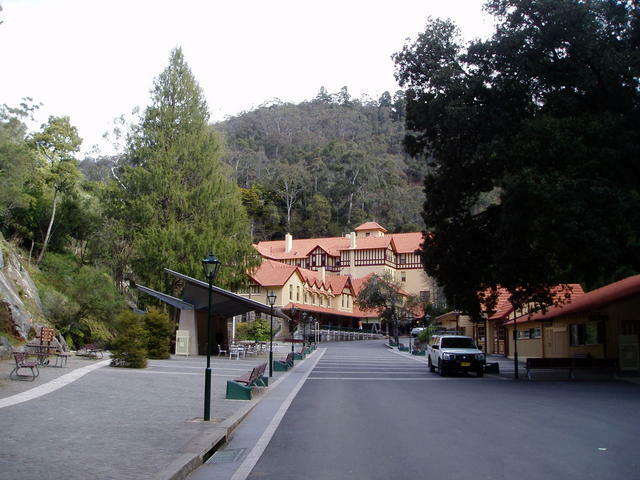 Jenolan Caves and the back road via Tarana and Oberon lies to the south, and the amazing Zig Zag railway is only 10kms north of Lithgow. So time to settle into the Blue Mountains and get your walking shoes on. And of course, time to check out some of the really great old Pubs in this area - they're full of history, and have great views in these parts! Historic Windsor / Richmond area which lies 47km almost due west of Sydney. 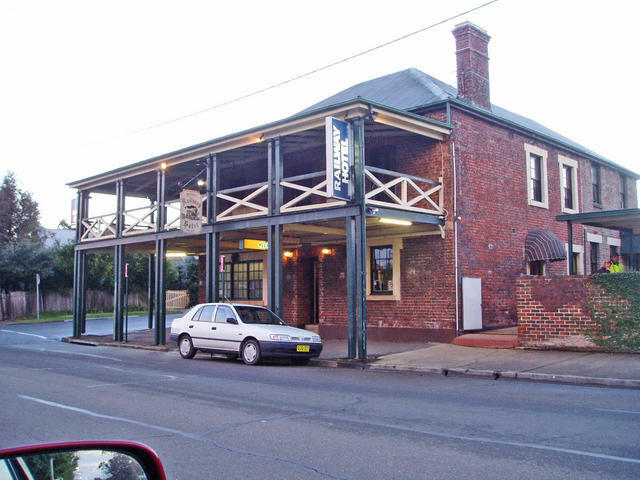 Windsor is outlined in the Hawkesbury Upper Pub Trail and with nearby Pitt Town. So check that pub trail for details of Windsor, which boasts some great pub history! We recommend staying in the Windsor area as an excellent stop over location away from the inner congested areas of suburban Sydney. 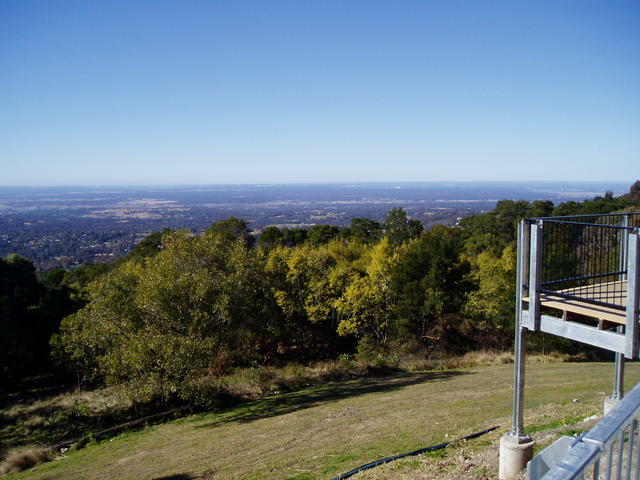 The Windosor area makes for an ideallic starting point for exploring the Blue Mountains area, tackled from the northern ridge of the mountain range, with excellent views back over Sydney as you make the accent up through Kurmond to Kurrajong Heights. Hawkesbury Museum and Tourist Centre located at 7 Thompson Square (enter the town on the Windsor Road which becomes Bridge Street, turn left at George Street - Thompson Square in one block along). It is open from 10.00 a.m. - 4.00 p.m. and has an excellent range of material about all the Macquarie towns as well as maps and descriptive walks around Windsor and Richmond. 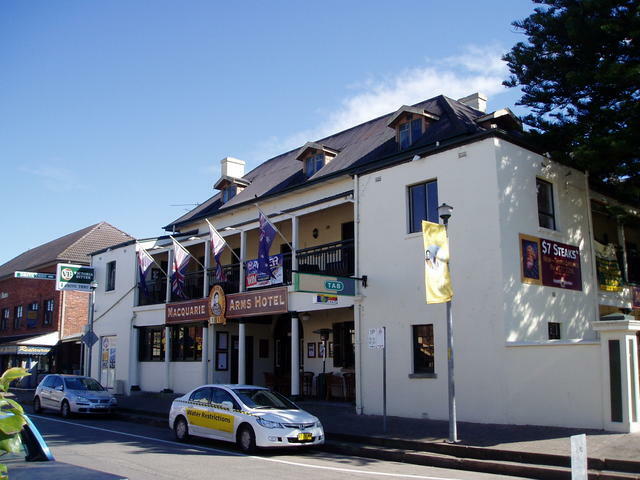 It is conveniently located adjacent to the Macquarie Arms Hotel - NSW's oldest pub! 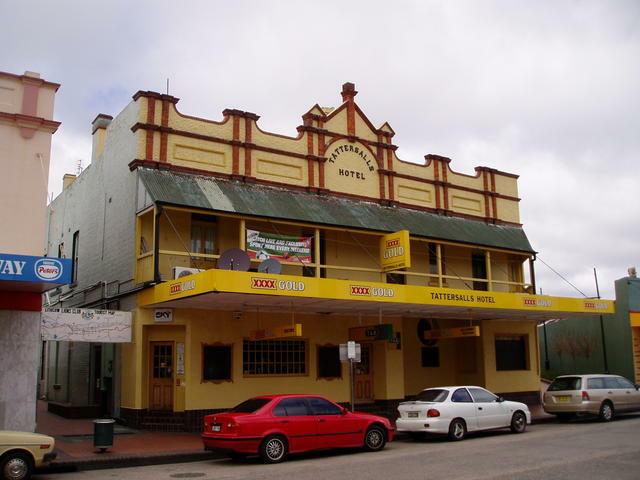 Macquarie Arms Hotel - dates back to 1815, located at the northern end of town at the Thompson Square. 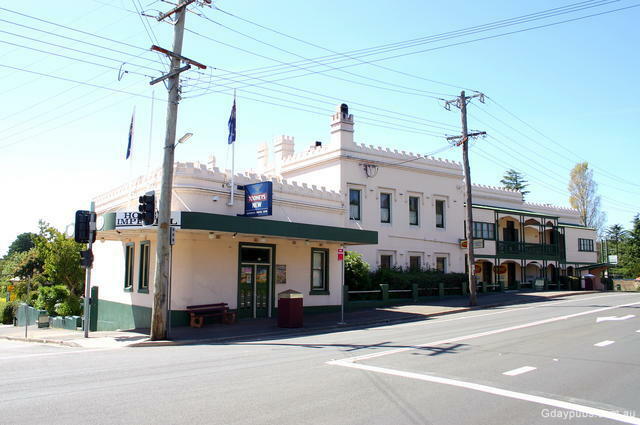 Railway Hotel at the southern end of town. 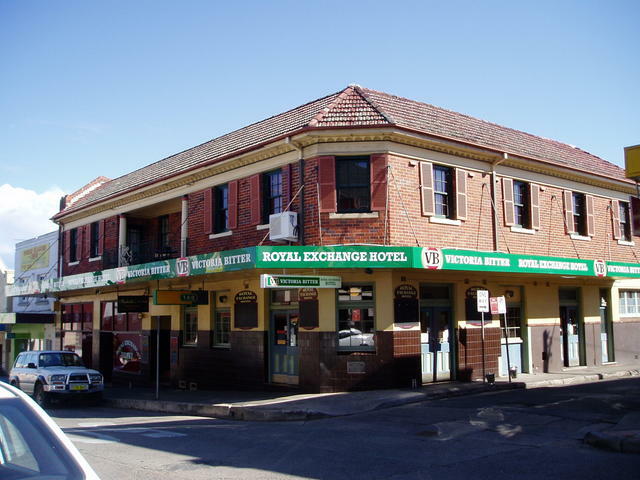 Royal Exchange Hotel is located in the middle of town close by the main shopping precinct. Richmond's history dates back to 1794 but today is quite a large city. The Airforce base of course can't be missed as you travel from Windsor, into the main town. 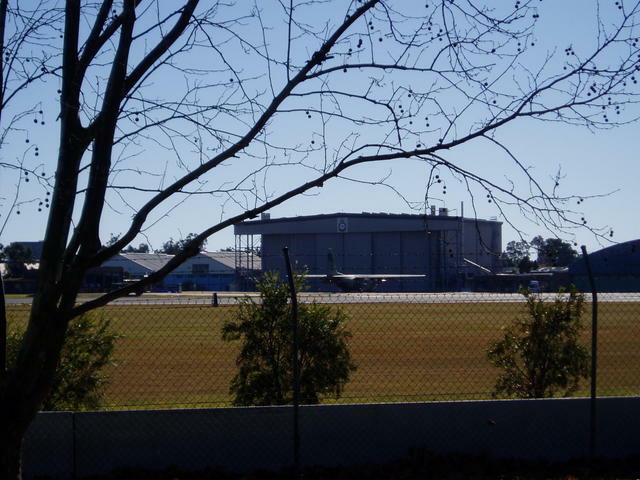 The base is always testing some aircraft, so don't be surprised to see some big birds overhead as the landing strip is right beside the main highway. 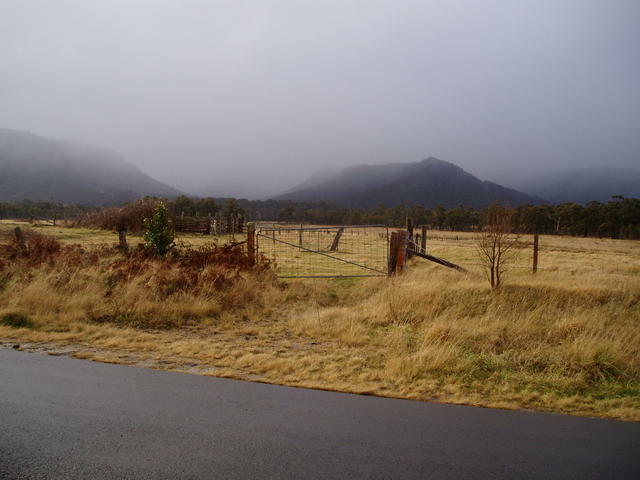 Travelling out through to North Richmond, you pick up the Bell's Line of Road, established back in 1823 by Archibald Bell Jr who sought to find a means of crossing through to the other side of the mountain range. Taking that trail, will lead you through Kurmond and up to Kurrajong Heights. If you're into historical pub matters, as you leave Kurmond and pass the north exit to Comleroy Road, slip south down the OLD Bell of Line Road a little ways, and you'll come by the former Goldfinder's Inn built back in 1851 (but now a private property and not ideal to view or see). It sits pretty hidden away these days, alongside the Wheeny Creek where Kurrajong Rd meets the Old Bell of Line Road. It stands alongside an original wattle and daub cottage, and at one stage was a General Store too. Some great information on the history of this Inn is available from the local history group and for Pub History buffs - makes a good read. Returning to the main road again on the Bell's Line of Road, continue on up the mountain through Kurrajong and wind up through Kurrajong Hills. Be sure to take a break as you near the summit at Knight's Hill, and pull into the lookout area on the north side of the road. (carefully!) The view is great on a clear day - stretching right back across to Sydney. Carry on through to Bilpin - renowned for its apples. Definitely worth a stop here, for some local produce. Shortly after, you'll come to Mt Tomah, where you can take a diversion into the Mt Tomah Botanical Gardens. These are extensive, and you can easily spend quite some time wandering the many fine sections that are on display. Once you reach Bell, its time to head south to Mt Victoria. It is possible to go west to Lithgow from Bell too, but that area will be covered as part of Lithgow and Clarence when visiting the Zig Zag railway later on. So head on down to Mt Victoria and Hartley area, taking the Darling Causeway which follows the railway line. Richmond - with its Air Base, right on the highway as you travel a couple of kilometres west of Windsor. The Visitors Centre is opposite - so this is a good spot to get some information for the trip ahead, grab a coffee and check out the Hercules aircraft often doing test flights in and out of the base, just over the road! View from Knight's Hill at Kurrajong Heights on the Bell's Line Of Road. Mt Victoria is on the steepest descent from Blue Mountains heading out towards Lithgow and Bathurst to the west. Joining in from Bell from the north, you arrive at the T-intersection of the Darling Causeway and Great Western Highway. Just before reaching that corner, you pass the Mt Victoria Railway station, and perhaps this is a good spot to pull in and start your walking tour of the town. There are some great old historical buildings here, not the least of which is the impressive Imperial Hotel with its magnificent dining rooms and bars. 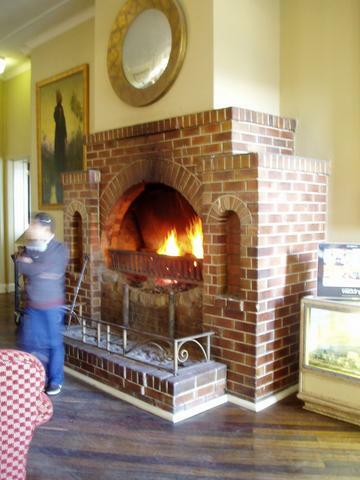 After that long drive up from Kurrajong its definitely time to stop and take in some fine hospitality of this Hotel. 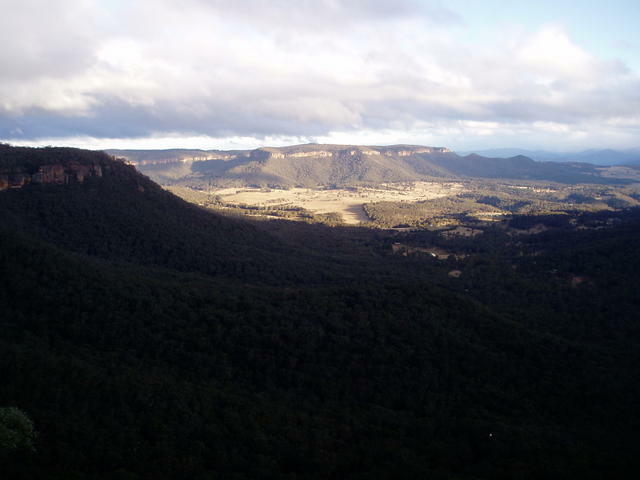 One of the best views to the south into the Megalong Valley are from the lookout that is just on the start of the descent down the Victoria Pass heading down to Hartley. Boys will be boys - the Mount Victoria antique toy shop has every imaginable dinky car, hornsby train, meccanno set and model aeroplane imaginable! 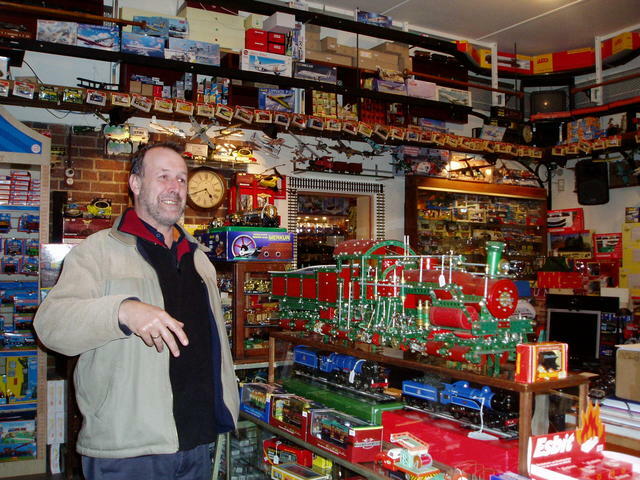 Whilst in the centre of town at Mt Victoria, take a walk along the park to see one of the biggest and best collections of antique toys! Something different to see, that's for sure, and of great delight to the young (and not so young!). 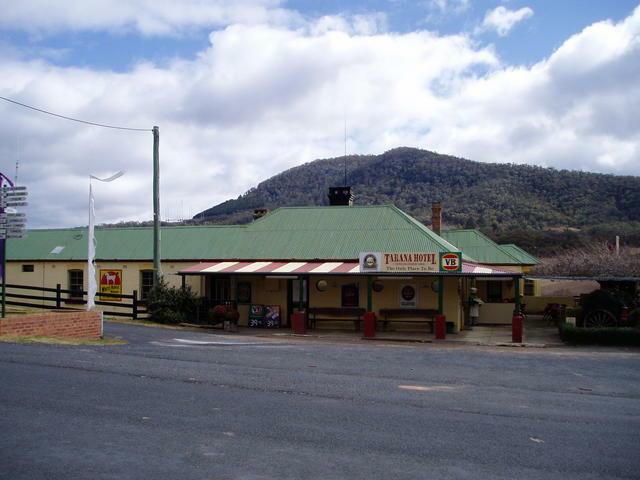 Hartley is on the Great Western Highway and lies at the foot of Victoria Pass. These days, there is no town as such, but there are a number of business operations and cafes spread out along the highway. Taking the turnoff at Hartley, to the north via Hartley Vale Rd, takes you through to an intersection leading to either Lithgow via Vale of Clwydd to the west via Brown's Gap Rd, or into Hartley Vale just down from the corner to the east. Along this road, is the entrance to the Venice Caravan Park which is a little hidden away but a very nice quiet place to stay. John who owns the park (02 6355-2106) is one of those tru-blue Aussie chaps that just makes sure you have everything you need for a comfortable stay. So if you're caravanning with pets - this is a top place to remember if looking for accommodation with a rig in the Ble Mountains. 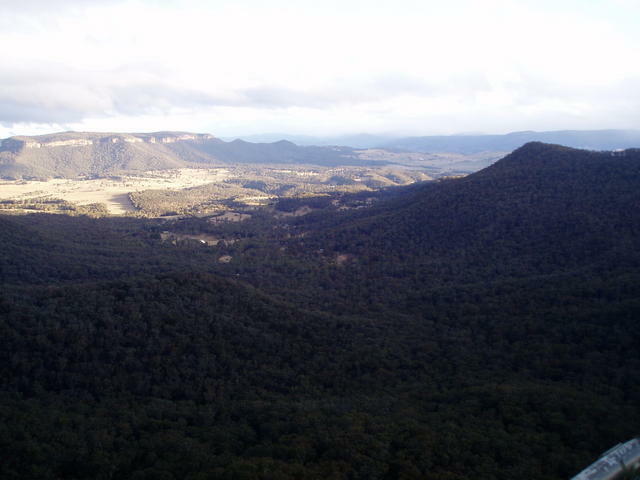 This area is well positioned, midway from Katoomba, Jenolan and Lithgow - and is an ideal location if staying in the area for a week as we did. Ten minutes down the road to Hartley Vale is a pair of great historical Pubs of the area but they currently operate as a cafe and a BnB - but driving down to check them out is a nice way to slip into Lithgow the back way. heading from Hartley Vale a little back on your tracks to Lithgow, you pass up through a major cutting that gives you an idea of what lays ahead - the lookout from Lithgow called Hassan's Walls. Let's get a few confusing 'Hartley' names sorted out. Coming down the mountain, west from Mount Victoria towards Lithgow, you pass though a couple of stores in the area known as Little Hartley - which is on the main highway itself. 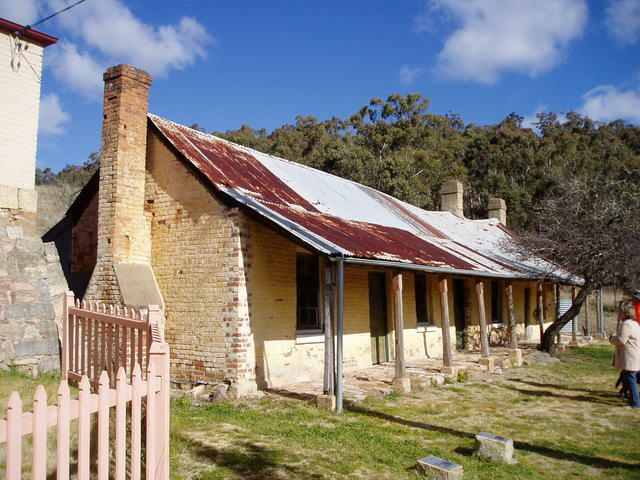 Further towards Lithgow, still on the main highway, you reach old Hartley Village - which is an historic display of the former township buildings, court houses and church buildings, including the former Shamrock Hotel. They're all standing, and well documented for doing a self-guided walk. This is an historic prescinct for walking and visiting only. The Jenolan Caves Road peels off to the LEFT, to the south-west from this point, and the area is also known as simply: Hartley! Meantime, just back a little from where you came down from Mount Victoria, you would have passed a turnoff called: Hartley Vale Rd, which is a nice back way to the north, and when you go down that road, you can eventually split off RIGHT to see Hartley Vale, or slip west, LEFT, to Lithgow over the mountain via Vale of Clwydd (Yep: that's how it's spelt!) 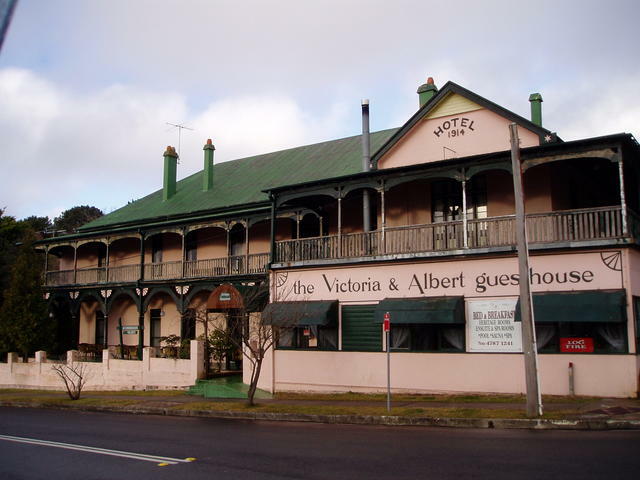 If you branched to Hartley Vale, you would come across the two former hotels listed here, that are now private/BnB operations or provide meals only. 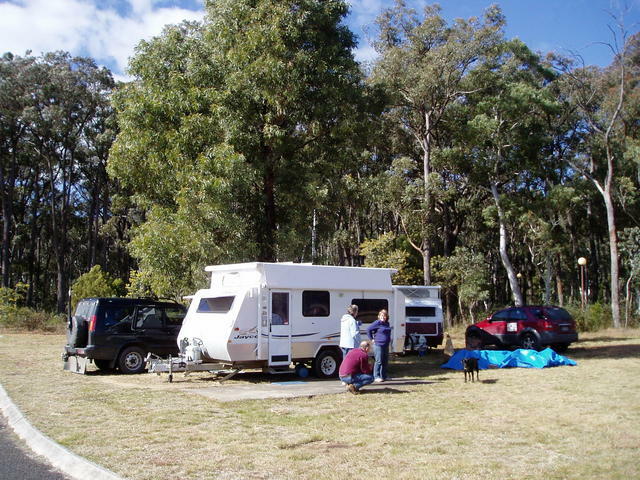 Also at that turnoff from the main Mount Victoria to Lithgow Rd intersection with the Hartley Vale Rd, is a quiet, pleasant caravan park: Venice Caravan Park in Little Hartley. It has everything you need as a caravanner, and it is one of the few places you can take your dog, and base yourself in this whole area conveniently for a few days. Oh, and yes, there is Mid Hartley Road too - but there is no township by that name - I think that one was just thrown in to help you cut through the middle of all this! It wasn't needed for any of the Pub Trail discussed here. So study the map on this page - you'll need it! Historic street scene of Little Hartley Village. Take a wander! Lithgow is a quite a large, and well stocked town for most needs of the traveller. 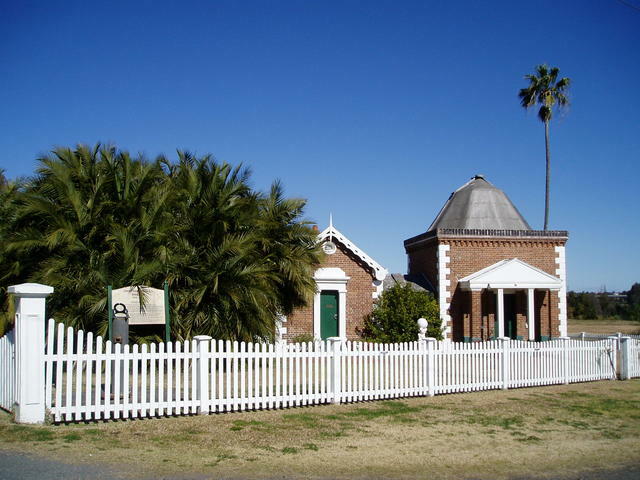 It has a number of interesting historical sites to visit and as well as some scenic attractions too. Just on the northern edge of town, is the site of the State Mines and there is quite a number of mining equipment rigs and displays to see there. Meantime, about 7kms east of the town heading back towards Bell on the Chifley Rd, is Clarence railway station that marks the start of the Zig Zag railway line. 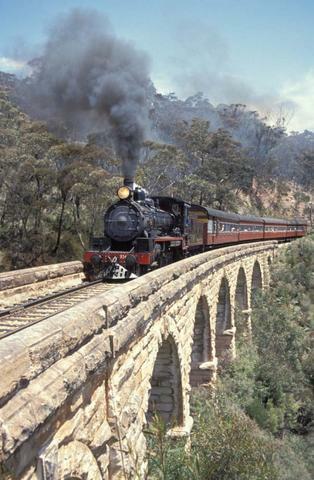 The Zig Zag railway, as the name implies, criss crosses down the escarpment from Clarence down towards Lithgow. Along the rail journey are a number of historic rock bridges of immnence proportions and built on the what is best described as a cliff edge - quite an engineering marvel of its day. 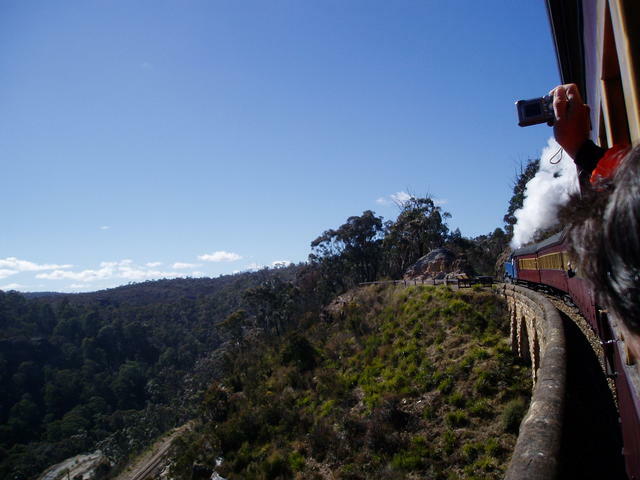 Tourists can enjoy a steam or motorised train ride down to the lower railway workshops. This is a highly recommended trip to consider. Meantime, back in the middle of town of Lithgow, take a few minutes to drive from the mid-point of Main Street south up Hassan's Walls rd to the lookout of the same name. From the short walk from the carpark you'll be rewarded with a great cliff edge view down over the Great Western Highway way below, with views back towards Victoria Pass. Hang onto your hat if its a cold windy day - it's quite a drop! Then head back into town where you'll find a number of great local pubs in along Main St to sit back with the locals and find out some more treats of this area to explore. 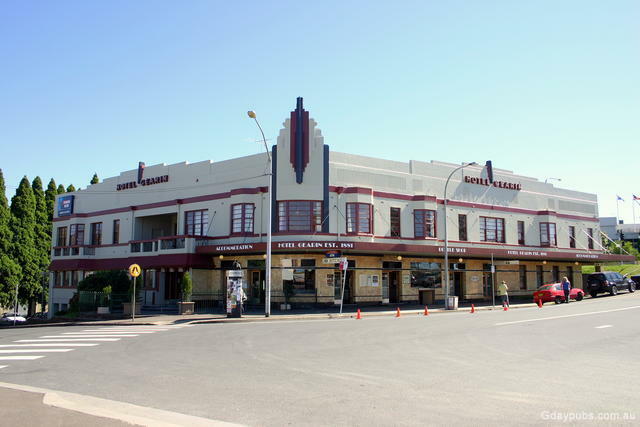 The town has a well established visitors centre, located on the Great Western Highway at the western end of town, just one block north of the Main Street intersection - next to the old railway station. travelling the ZigZag railway steam train from Clarence down to the Lower Points. The old railway line from Lithgow used to pass west to Wallerawang and down through Rydal, then on to Sodwalls to Tarana. So if you're interested in a bit of sideline exploration, head on just out from Lithgow south down the Great Western Highway and take the shortcut along the Magpie-Hollow Rd from South Bowenfels and take in the southern view of Lake Lyell and then cut back north up to Rydal at the Rydal-Hampton Rd intersection. 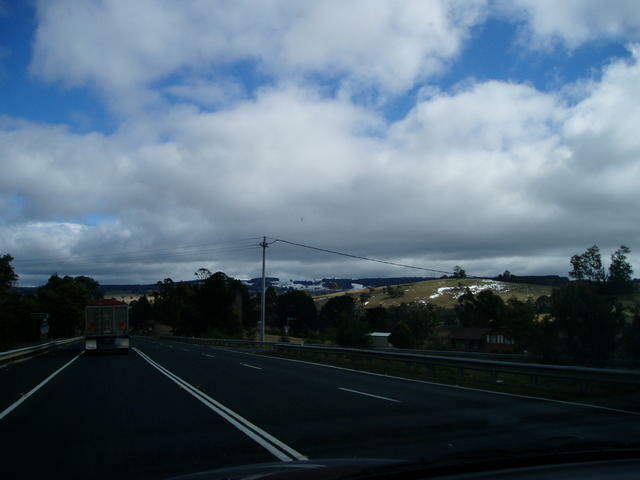 The alternative is to head out of Lithgow well out west and take the turnoff at south down the Old Western Rd. 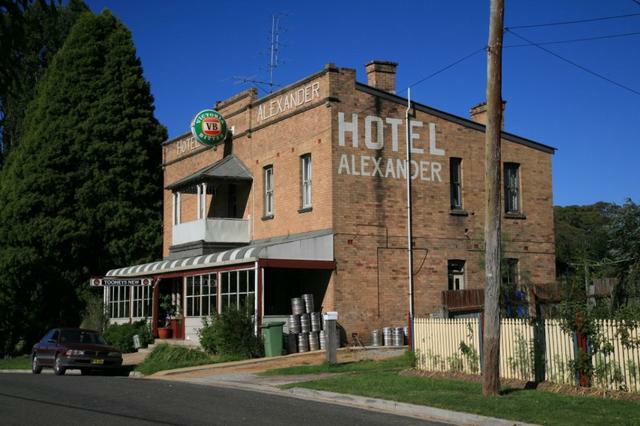 The trip is well worth the time, to get to visit the Alexander Hotel in Rydal (the 'Lydal Hotel') - where you'll get to experience some good old fashioned hospitality in a fine old Aussie Pub. Slip on down through Tarana now, by exiting south from Rydal down the Rydal-Hampton road and pickup the Rydal-Sodwalls-Tarana Rd that will take you west through Sodwalls on the way. Just slow down and watch the narrow bridges and causeway where the railway line track loops around the creeks that meet here. You'll emerge in the middle of the village of Tarana, and be able to check up on what's happening at the Tarana Hotel. Here's another example of great country pub. The road north from here could take you back to Lithgow via the Great Western Highway - but this pub trail takes you south to Oberon. Take a good look around Tarana and in winter, on a clear day, you will catch sight of snow in the distnat southern hills where you're heading. So watch for possible black ice and slippery roads from here on south, as the locals want you to slip in for an ale for the right reason! 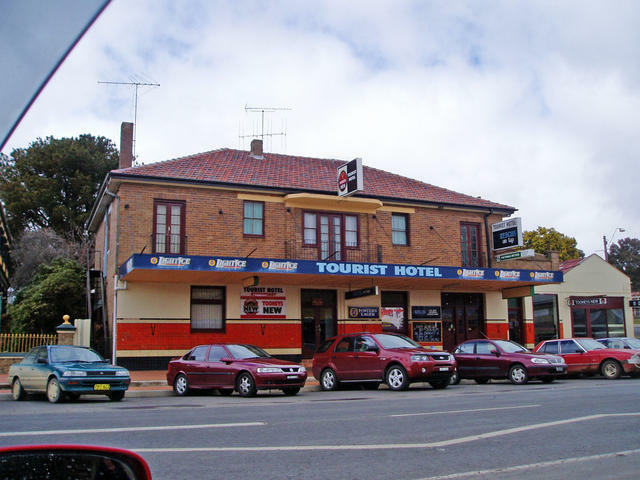 Accommodation is available at the Tarana Hotel and the pub boasts a top bar as well as beer garden. Tarana Hotel's main bar and beer garden. 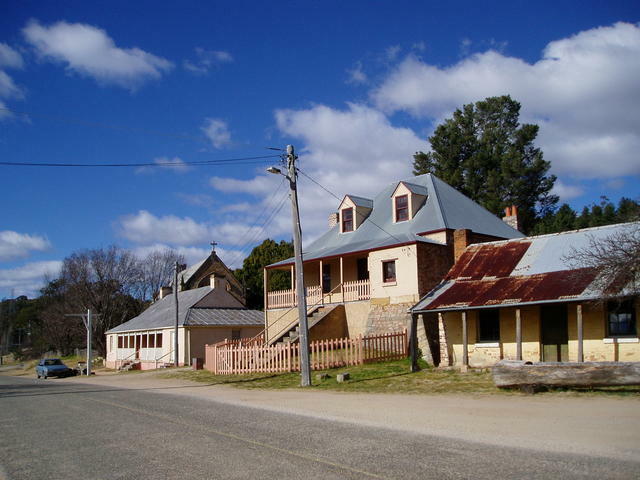 Oberon is a large town, situated fairly close to the snow line, so it can get a bit chilly here in winter - but that just adds to the cgreat character of the area, and should put you travellers in the mood for sitting around a great roaring fire in one of the locals. 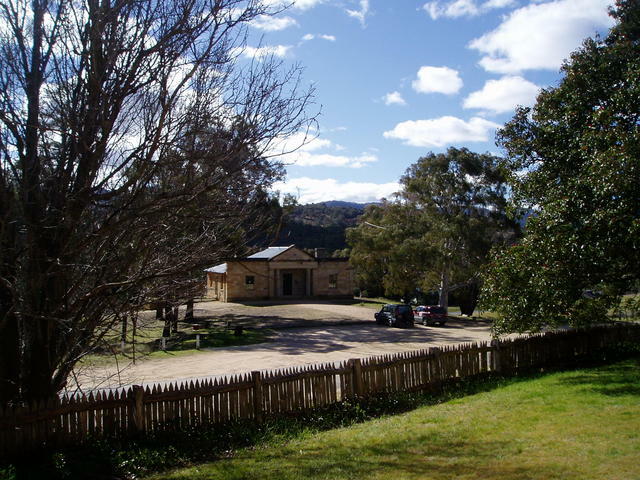 Everything is available in the town, and the visitors centre can help you with road conditions and any plans for Jenolan Caves down in the valley from here. Take the Edith Rd exit south-east of town that takes you to Jenolan Caves. It is also the place to find The Visitor Information Centre on the corner of Ross Street and Edith Road (Phone: 02 6329 8210). Edith road meets junction of Kanagra rd and Jenolan Caves Rd, just short of a steep descent down into the Jenolan Caves Chalet. Now one option is to consider heading way out to the Kanagra Walls for some really great walking treks. The views are really great out there, and you get a a real feeling of isolation - and it is isolated - so go prepared and let people know your plans and return times. You should devote a good half day or more for this, as it is a one way out and back situation. So plan on separate days perhaps, if considering both the caves and the wall, and plan for some local overnight accommodation at some of the nearby pubs mentioned in this trail - perhaps splitting the trip up from Oberon side and Hampton side. 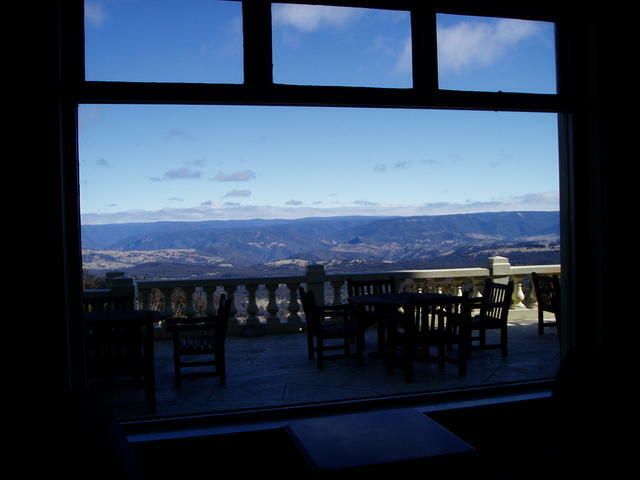 Jenolan Cave resort, cafe, bar and accommodation. 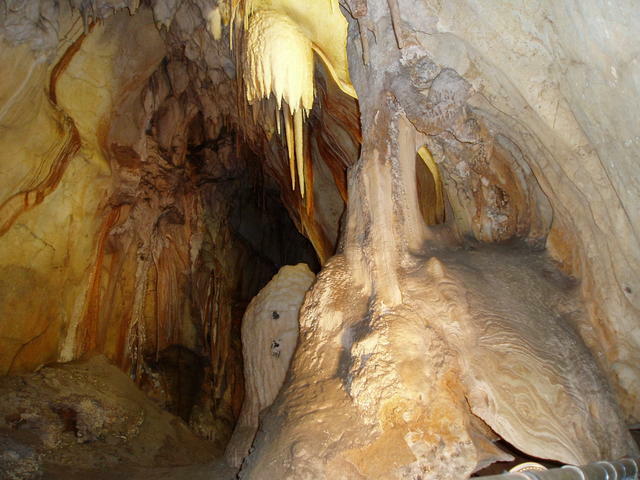 For tour of the spectacular caves at Jenolan, one approach is to make a round trip by coming down to Oberon to reach Jenolan. 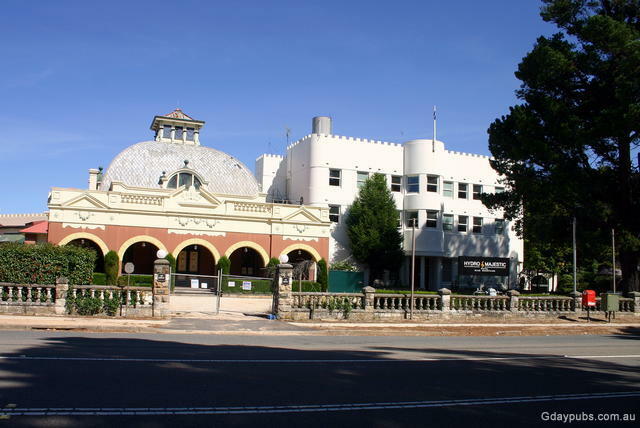 An early start out of Mount Victoria/Lithgow area can get you to Oberon early in the day for lunch, and still leave time to get down to Jenolan for one cave visit in the afternoon. But ideally, if caves are your interest, then consider staying at Oberon and do a couple of daily runs down - or go all out and spend a night at the Chalet at Jenolan itself. Even in the cold months of August, the run down from Oberon to Jenolan is a real treat - with snowlined forests to see on the way down. 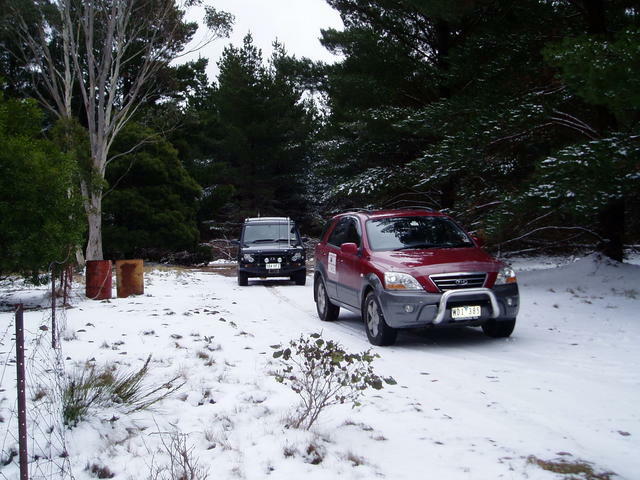 Oberon is just above the snow line, so be prepared and call ahead to make sure the roads are actually open!. The trip out from Jenolan to Hampton to arrive back at Hartley is sealed, extremely narrow but a brilliant drive as you ascend up to Mount Inspiration. 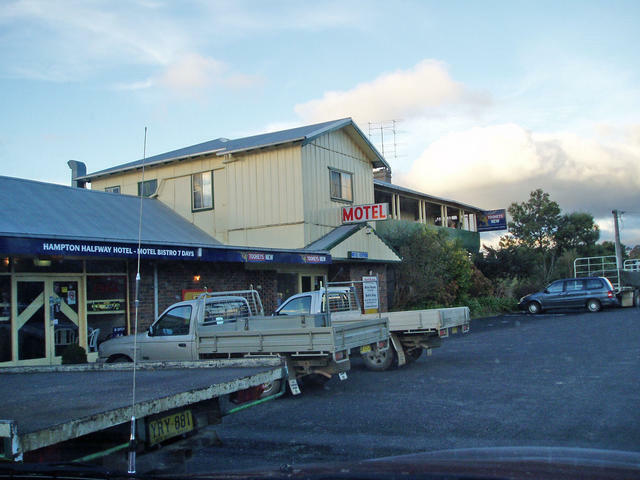 Tourist Hotel in the elevated township of Oberon. Now if you've over indulged yourself with cave exploring at Jenolan - how about linking the Halfway Hotel at Hampton into your itinerary? 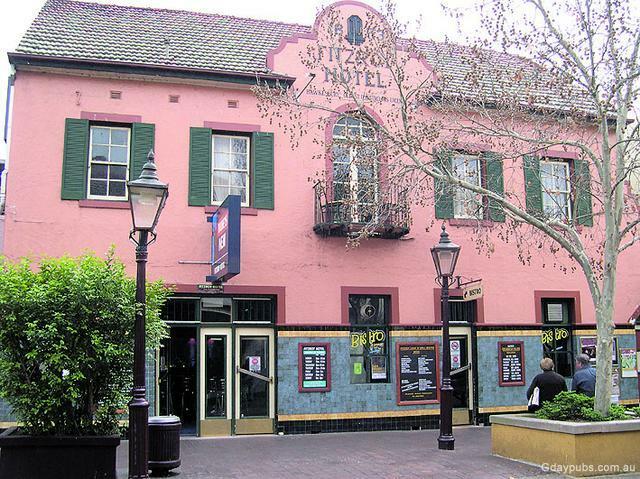 This Hotel, dating back to 1863 is renowned for its home-styled cooked meals and has accommodation too. 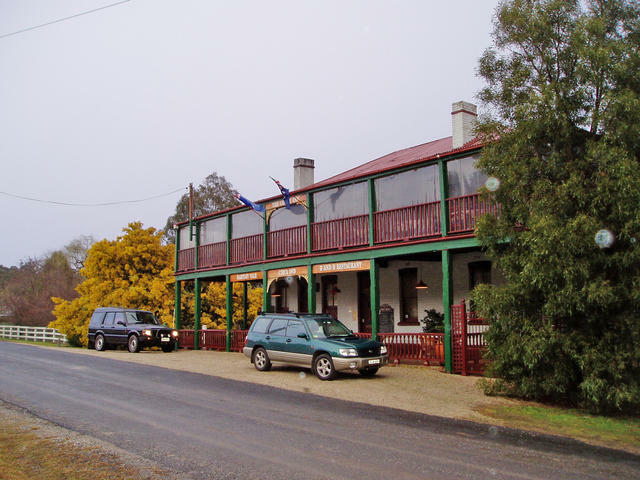 So here's a great opportunity to lengthen your stay in the Jenolan caves area, and enjoy some local hospitality! 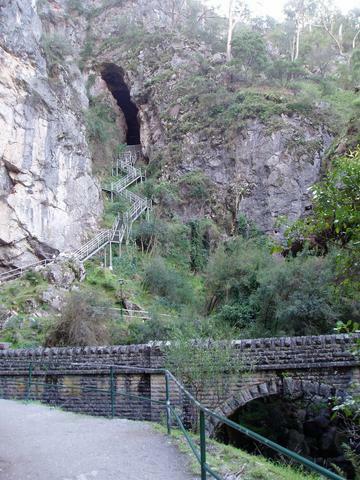 The exit road from Jenolan Caves to Hampton, at the entrance of the Devils' Coach House - showing the outside viewing paths. Typical limestone formations in one of the many excellent caves you can tour at Jenolan. Hampton Halfway Hotel - a top place to stop by at the end of a cave exploring day. Top meals, accommodation and good old local hospitality - since 1863! Okay, so the valley and the caves are all done - so now it's time to have a look along the ridge. 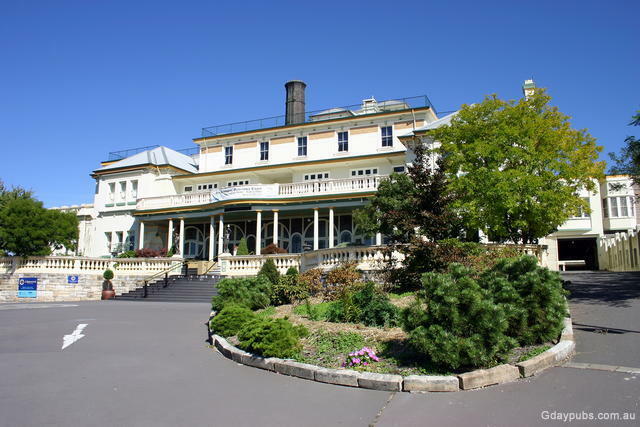 The top of the mountain from Mt Victoria through to Leura, includes Medlow Bath where you'll find the Hydro Majestic Hotel. Aimed more towards private guests, the hotel does have some access to passing trade too on certain days/times, if you ask. But this is truly a magnificent hotel, and would have to boast one of the largest open fires in the dining room that overlooks the Megalong Valley. Is this not the best open fire you've seen in a Hotel? Hydro Majestic Hotel - for that something a little special! Katoomba is pretty much the focal point around the Blue Mountains as far as commercial promotion of the scenic attractions is concerned. Just west of the town, is Echo Point with its huge observation area that overlooks the Jamison Valley and the Three Sisters. A short walk take you to the first of the Three Sisters rock formation and you can walk out onto the first of them. A stairway also leads you down to the valley below - but this is for serious hikers and the stairway goes striaght down the side of the cliff. Walking through the valley along what is called the Federal Pass can lead you around Katoomba Falls and to the bottom of where a number of rides can take you back to the top of the mountain again. The Scenic Railway has long been known for its near vertical descent. You practically lay down in the small carriages that take you stright down from the wheel house, and you're dropped to the valley in no time. 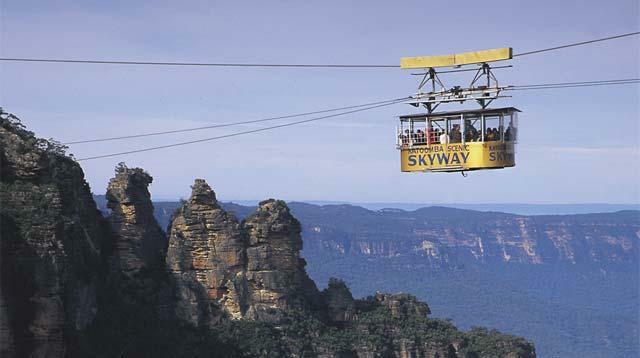 Overhead, at Scenic World, is the updated Scenic Skyway - which takes you from one cliff to the other, passing the Katoomba Falls. The third attraction is the Scenic Cableway that runs over the Scenic Railway, but also descends down deep into the Jamison Valley rain forest. All combinations of walks and rides are possible, to enjoy all these features. Stepping down the first of the Three Sisters and walking the gangway. For a great drive around the area, start off at Echo Point (at the Three Sisters) from the foot of Katoomba St, and go back on your tracks around Cliff Drive. Doing it this way, you'll find it easy toi stop off on the left-hand cliff side for all the vantage points. One of the best points to stop, is just past the entrance to Scenic World, as you round the corner, about 500mtrs south. From there, you can see the cable cars and the valley way below. 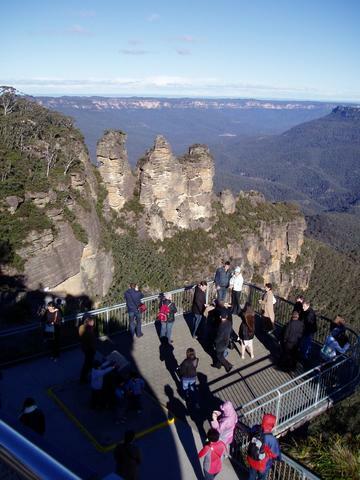 View of the famous Three Sisters rocks from the viewing platform at Echo Point, Katoomba. Finish of the loop by coming back along the highway again (heading east) and pop back into the main street of Katoomba to settle into some refreshment! We've only just started to touch on what is here to see in the Blue Mountains. The main road from Katoomba back towards Sydney takes you through Leura and Wentworth, and there are a number of falls, walks and observatory points to explore - and thats just the southern side. There's also the north side of the ridge that overlooks the Gross Valley out of Blackheath, heading back to Mt Victoria we covered earlier. So pick up all the information about these towns at the Echo Point Visitor's centre, and settle back into a refreshing ale locally and plan a few days of serious photo-taking and breathtaking views! The objective of this Pub trail was to get you to this point a bit of a different way, and to get to feel for the surrounding area, its history and what is really the Blue Mountains. But now you've arrived on top, well, it's time to play the tourist! And when you're done up here, then we've got some more out of the way trails nearby like Hill End Pub Trail if you're heading further out through Bathurst and then north!